I am loving that photography has given me permission to follow my whims…to make spur of the moment decisions that lead me to interesting pictures. As I left the university this afternoon I noticed hang gliders over the cliffs. Even though I had an appointment, I decided to take a few minutes for a detour to the nearby glider port. 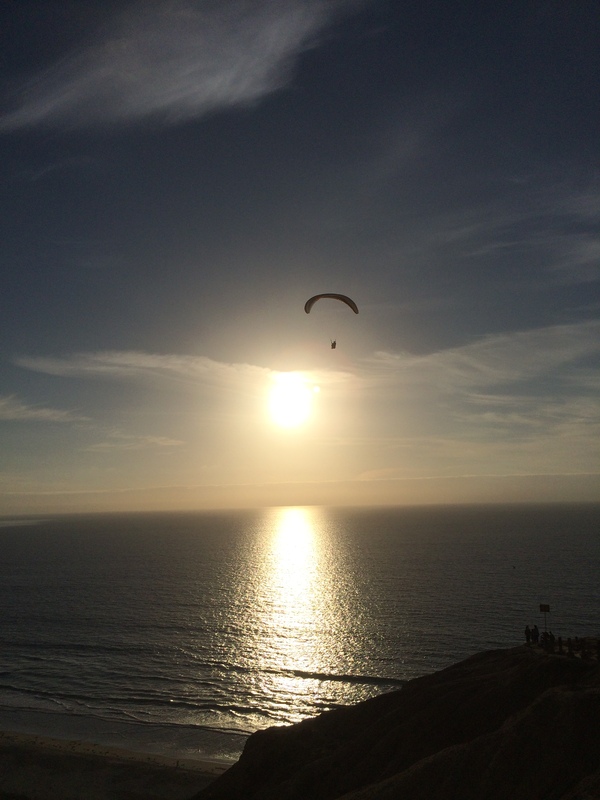 The sun was descending and the gliders were soaring above the cliffs…posing in the setting sun. This particular shot is unedited and unfiltered. I also noticed this other kind of glider…almost like wings. 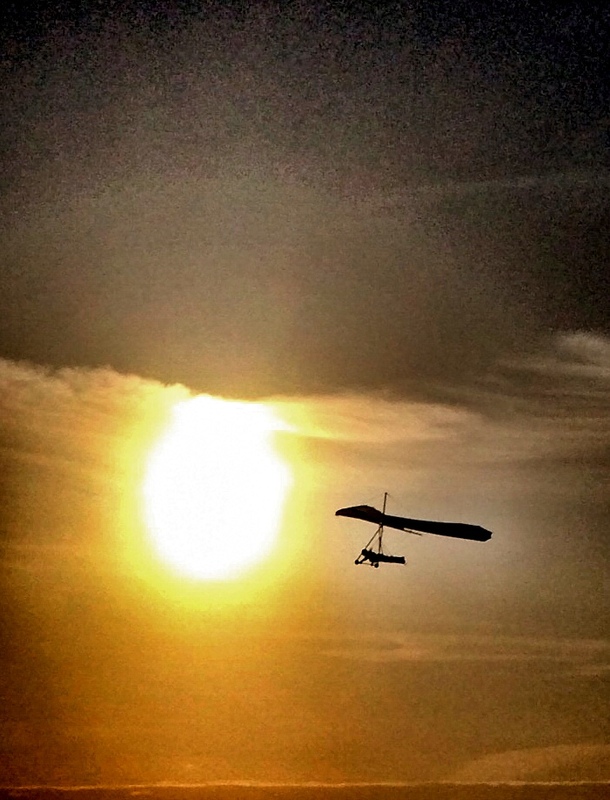 This guy soared bird-like into the light. Sometimes letting the lawn get a bit overgrown in a good thing…at least for the weed-loving photographer in me. My eye was drawn to this particular dandelion puff…and on a whim I started snapping shots of it, trying to capture its perfect spherical shape. A new grocery store opened near my house. It’s huge…and apparently creating vibrant vegetable displays is part of their grand opening business plan. I found myself snapping photos of the veggies, drawn by the colorful colors and shapes. 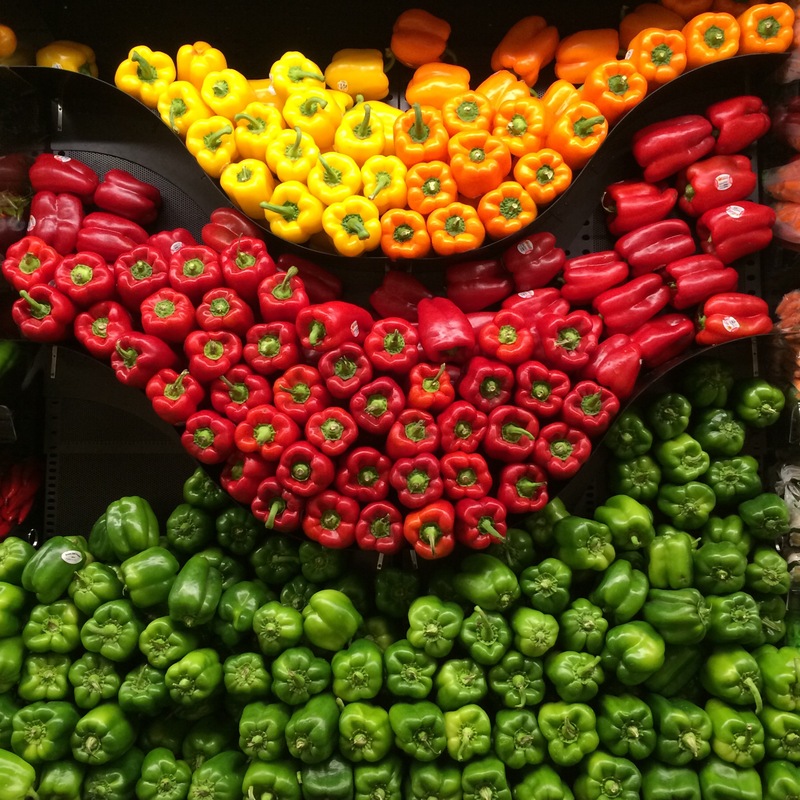 Will they continue to create these colorful pepper arrangements? 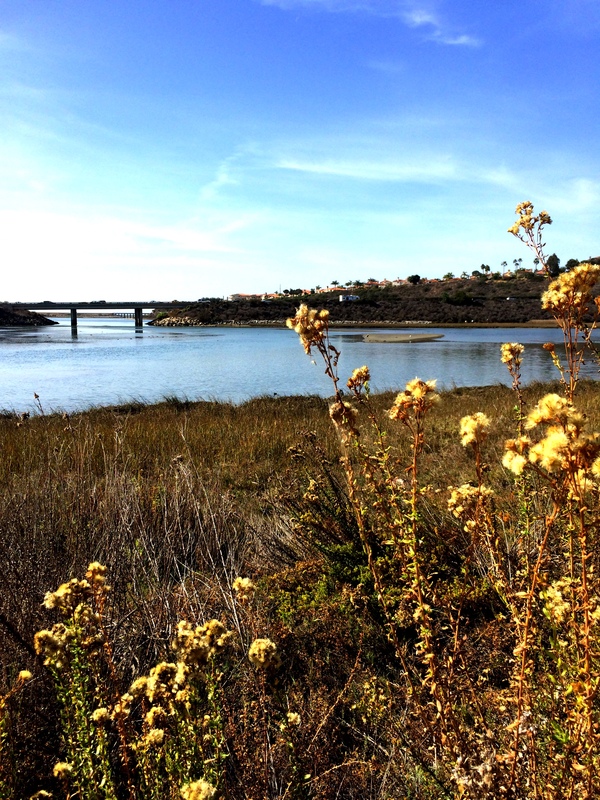 And last weekend was perfect for low-tide walking. On Saturday it was so low that I was seeing parts of the reef that are not usually not visible. On a whim I was taking pictures of the exposed reefs. Later I noticed the ways the ripples in the water played with the contours of the reef, creating interesting textures. 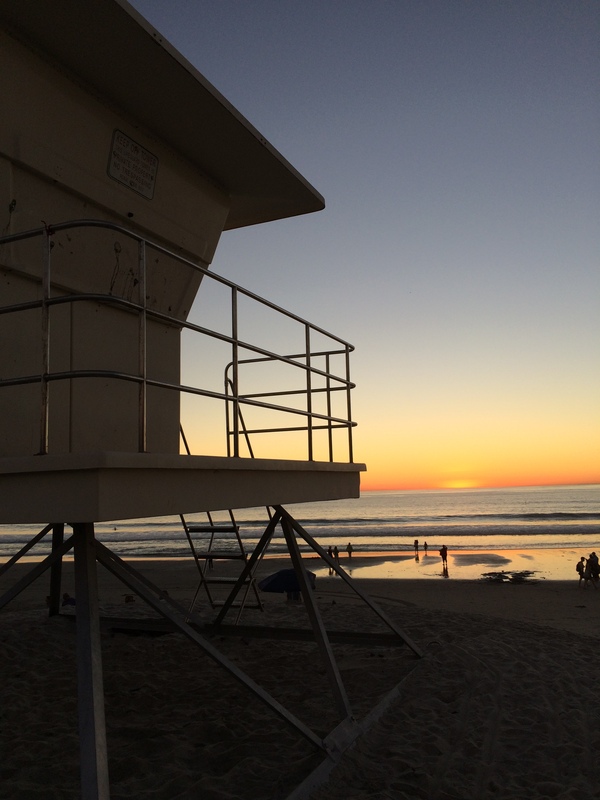 And who can resist a sunset shot with a lifeguard tower in the foreground? 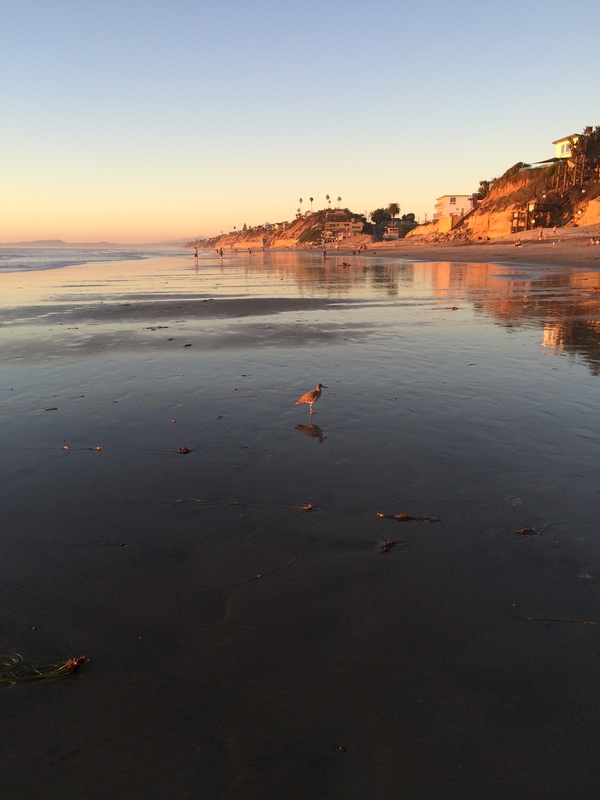 As much as I love the beach at low tide, sometimes I find myself there at high tide…and what a difference it makes! 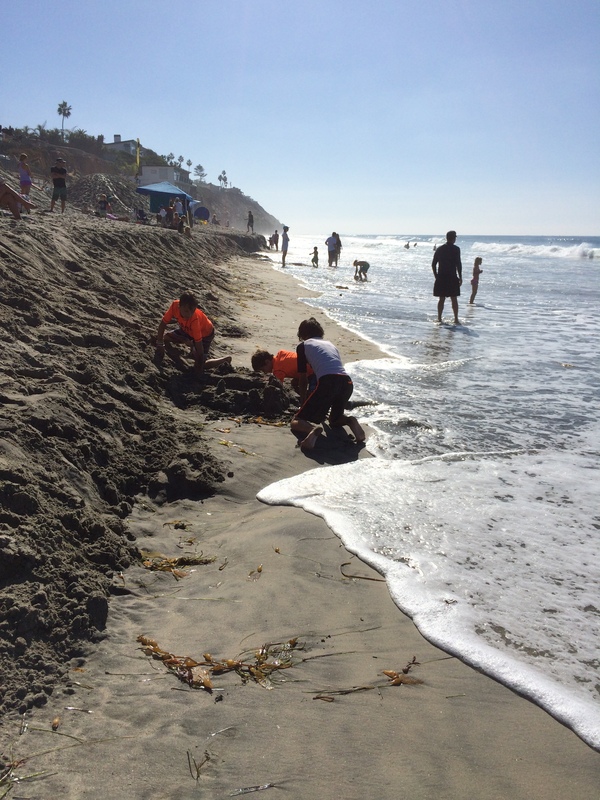 The wide beach of Saturday afternoon was replaced by a very narrow beach on Sunday morning. But that doesn’t keep people from enjoying the water, sun and sand…and it doesn’t keep me from taking a shot on a whim! What do you take pictures of on a whim? Do you go out of your way to photograph something that seems interesting? Do you stop on your way to work, on your way home to take a photo or two or three? Maybe this is your week to follow some of those whims…and see what you find! I share my photography and writing on social media. You can find me on Instagram and Twitter using @kd0602. If you share your photos and writing on social media too, please let me know so I can follow and see what you are doing. 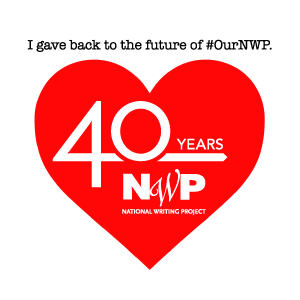 To help our Weekly Photo community find each other, use the hashtag #onawhim for this week and include @nwpianthology in your post. Where will your whims take you? What will you find when you give yourself permission to veer from your usual paths or timetables? I can’t wait to see what you find on a whim through your lens! 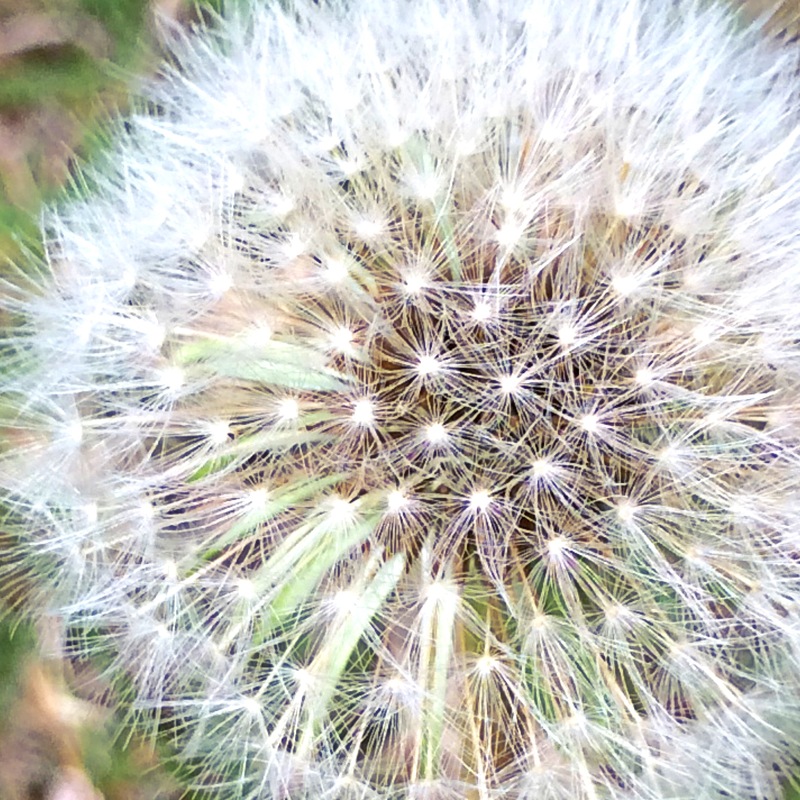 This entry was posted in Weekly Photo Challenge and tagged dandelion, iphoneography, nwpianthology, on a whim, photo essay, sunset, writing on November 13, 2014 by kd0602. 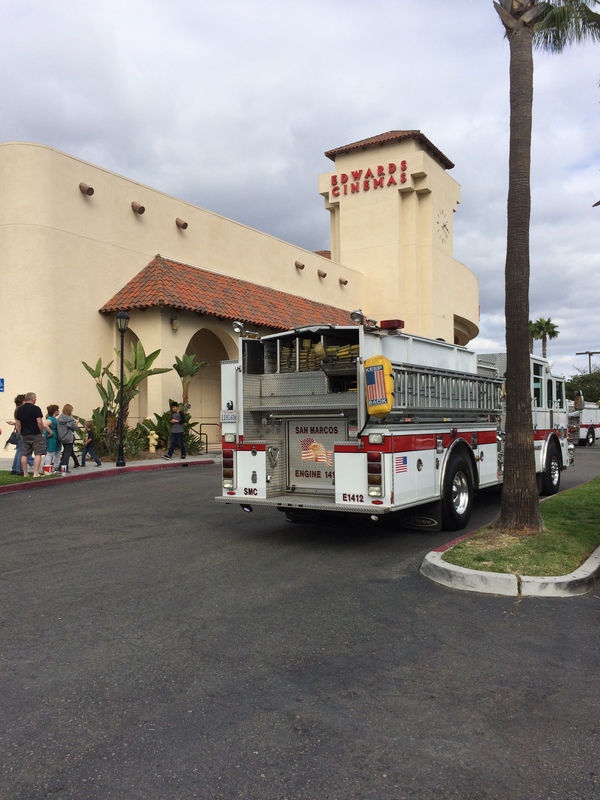 And so I was enjoying the movie, it was building to a critical juncture at about two hours in…when the fire alarm in the movie theater went off! The movie stopped, the lights came up, and the loudspeakers asked everyone to exit the building. My first thought was, oh no…I really want to see how the movie ends! People poured out the exits, wondering how they would see the ending of the movie. Most people seemed to think it was likely a false alarm, no one seemed particularly worried about fire. 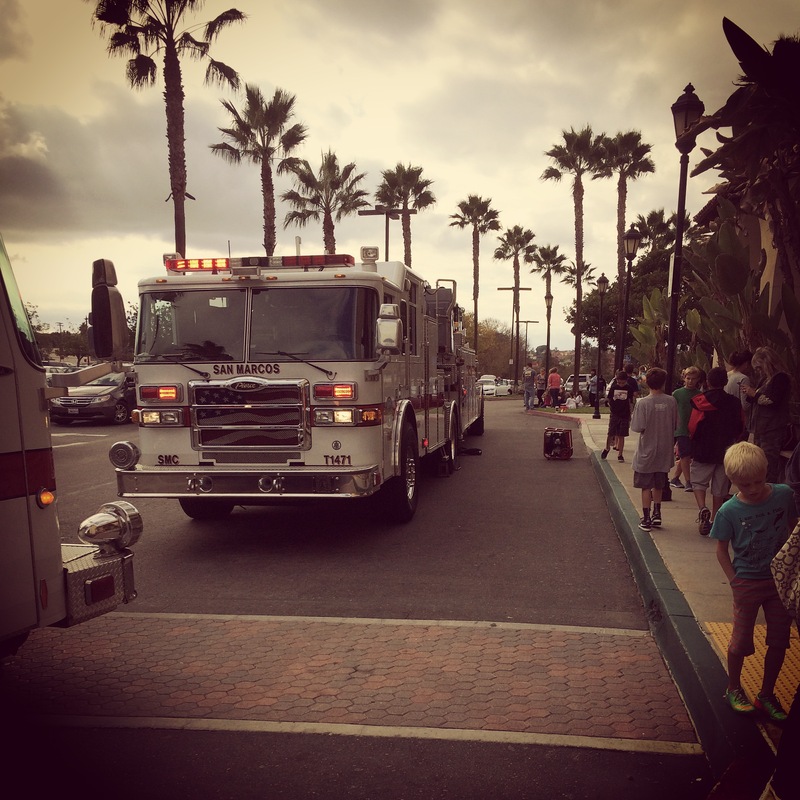 As we walked back around to the front of the theater, we could smell smoke. Lots of people were milling around, not sure what to do about the incomplete movie. Asking some theater employees, we found out that the Icee machine had gone up in smoke…and we could smell the resulting burn. We looked up and saw two police car race up the driveway with sirens sounding and lights flashing. Not long after, fire trucks began to arrive. It was clear that there was no active fire, so the firefighters went through procedures to clear the smoke and ensure the theater was safe. It was clear that it would take a while for this to happen, so after being reassured that our ticket stubs would be honored to see the movie at a later date, we headed off to enjoy the rest of our day off…without knowing how the movie ends! It was definitely a Murphy’s Law kind of moment. And when I ran into a couple of my students who had also evacuated from their movie, I found myself thinking about how the fire drills we have at school actually served them well in this situation. 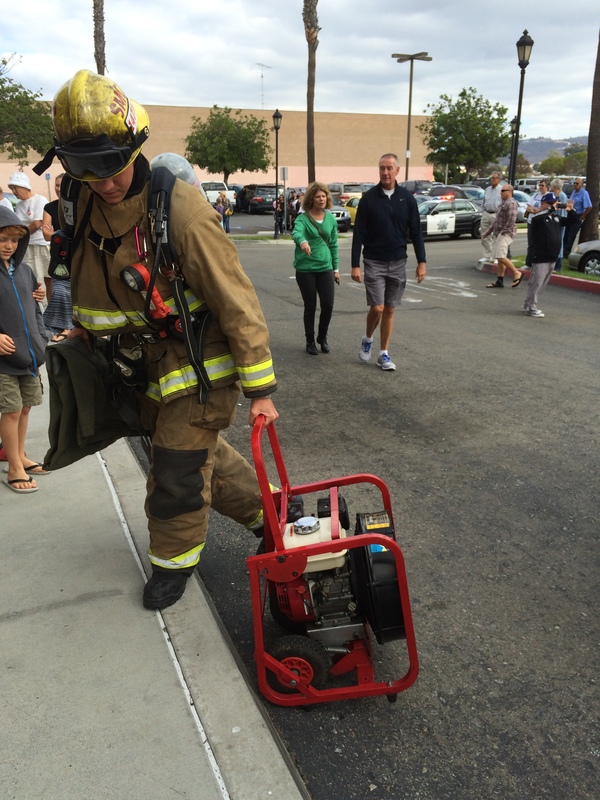 They knew about evacuating, they were calm and matter of fact about seeing the fire engines and firefighters…they put their drill experience to use. Don’t tell me what happens in Interstellar, I’ll be heading back to the theater later this week to see it…even though I’ll have to start from the beginning again! This three-hour movie is turning into a five hour event for me…it better be worth it. Murphy’s Law at work! This entry was posted in Slice of Life and tagged interstellar, movies, murphy's law, photo essay, photography, writing on November 11, 2014 by kd0602. I love the beach. I love to walk. I love to take pictures. 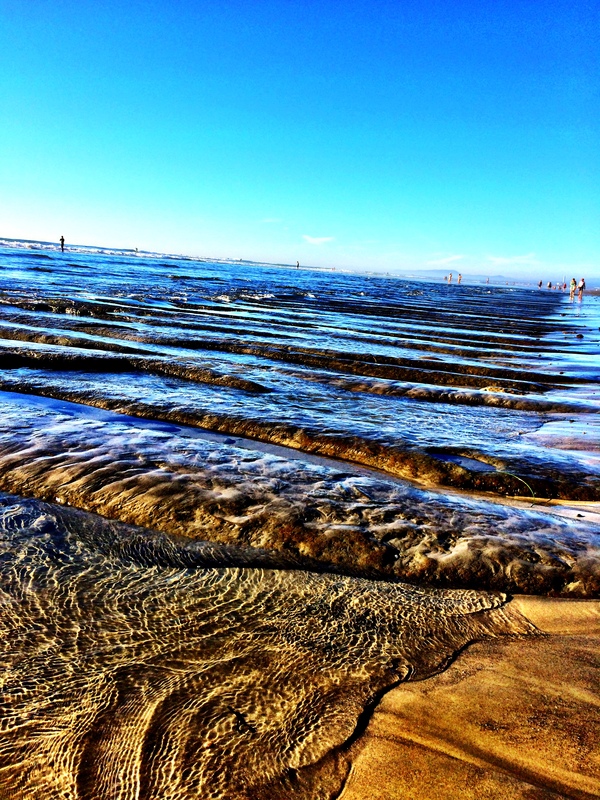 And a perfectly timed super low tide, summer-like weather (in November! ), and the just-right prompt set me off for a meditative adventure (is that an oxymoron?) this afternoon that combined the three. 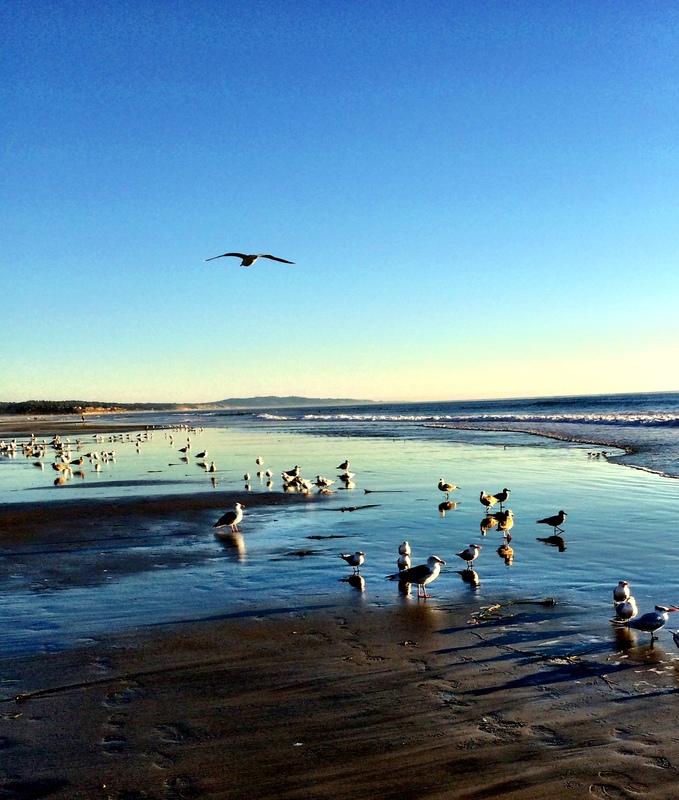 I’m always surprised by how much the beach changes from week to week…sometimes even day to day. 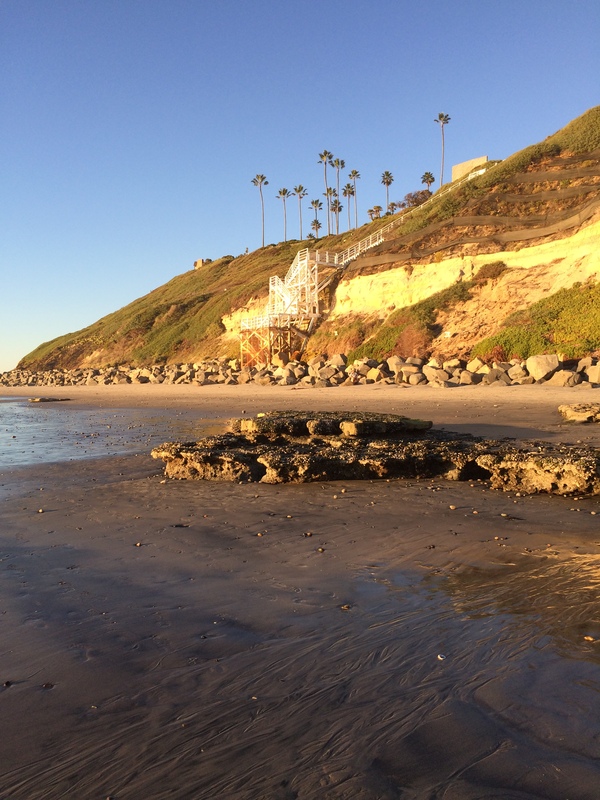 When I arrived today, I noticed right away that the fairly flat beach had been replaced by a large berm, seemingly to protect the permanent lifeguard structure and upper sandy area from the late fall/winter tide patterns. 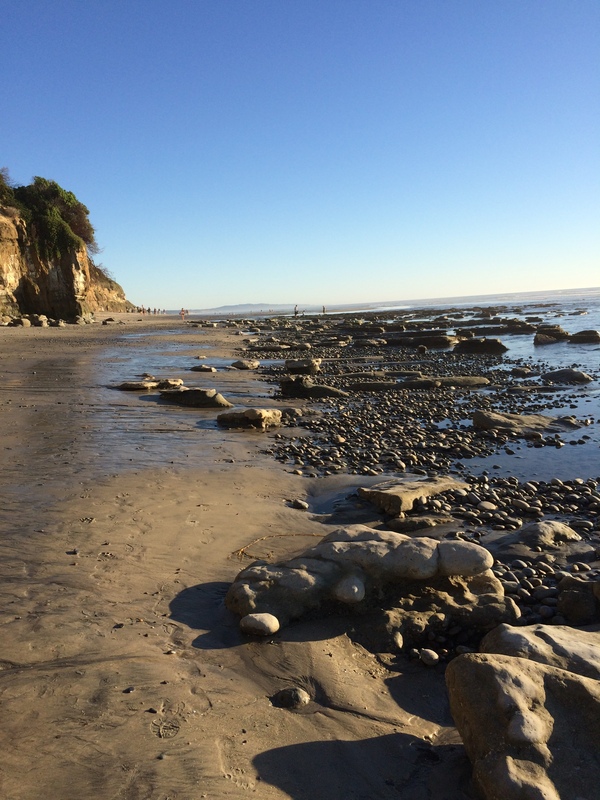 And as I began to walk, the super low tide revealed rocks that have been covered by sand all summer. What was a smooth sandy beach a few weeks ago, is now rocky. The simple, minimal beauty of rocks and water and sky is profoundly calming and relaxing. I found myself breathing deeply, soaking in the peace. Walking further, I found I could walk on sandbars that put the open ocean on one side of me and pools and rivers of sea water on the other. I was mesmerized by the reflections of light and the soft ripples as the wind played with the water. 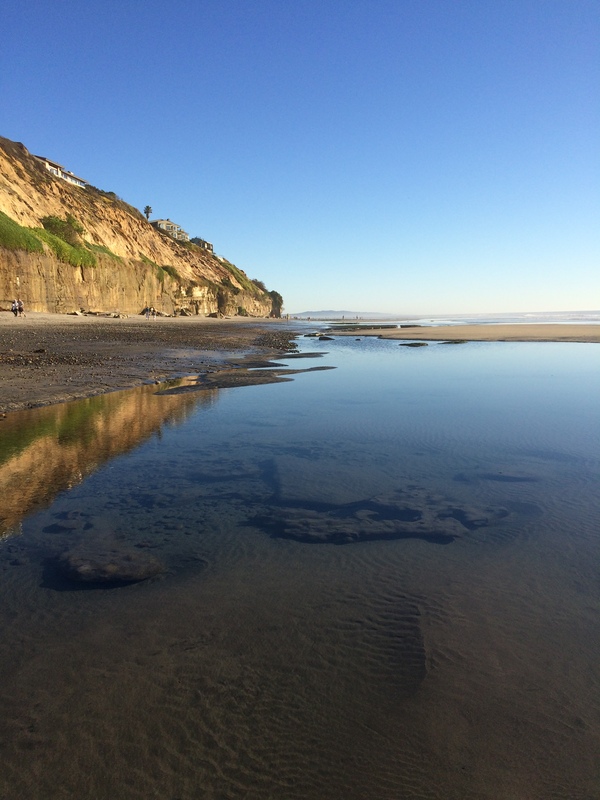 A recent Huffington Post article entitled Why Being Near the Ocean Can Make Your Calmer And More Creative seems to confirm my experiences with the beach. The monochromatic shades of blue, a minimalist masterpiece of blue sky, blue water, blue shadows…caught my eye as I caught this bird in flight. As I turned around to head back to my starting place, the sun had moved lower in the sky, painting the landscape with warm light. Oranges and yellows replaced the blues as the sun painted the sky. 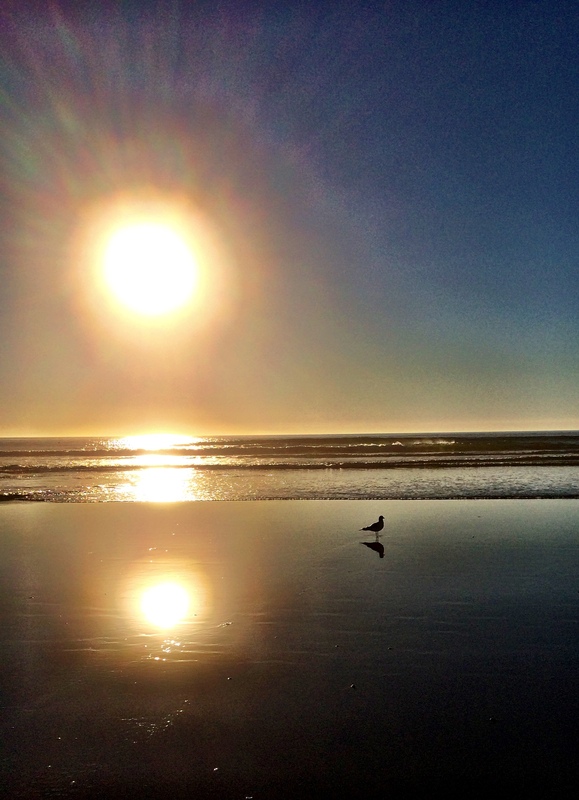 A lone bird, the sun multiplying as it is reflected in the water and a minimalist portrait of solitude emerges. A perfect, peaceful ending to the work week. 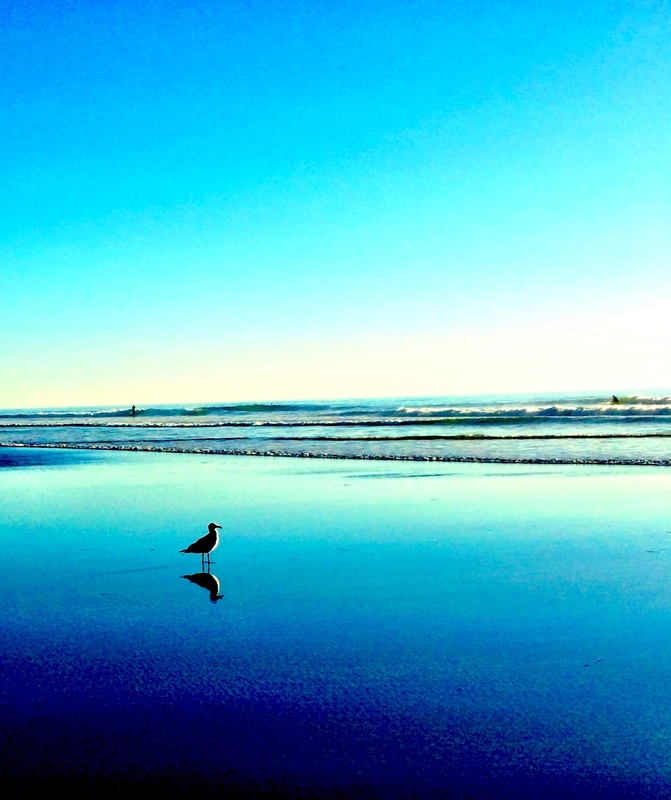 This entry was posted in photography and tagged beach, iphoneography, light, minimalist, photo essay, postaday on November 7, 2014 by kd0602. I’m not a fan of the time change in the fall. I mean, I love getting the bonus hour…for sleep, walking, exploration, photography…but I hate getting home when it is dark, especially when it isn’t even 5pm! But in this first week of the time change, I have found some interesting images BECAUSE of the time change. I’ve been trying to squeeze more time for physical exercise into my life…and this week I’ve been carrying my gym shoes so I can take the time for a walk at the end of the day. 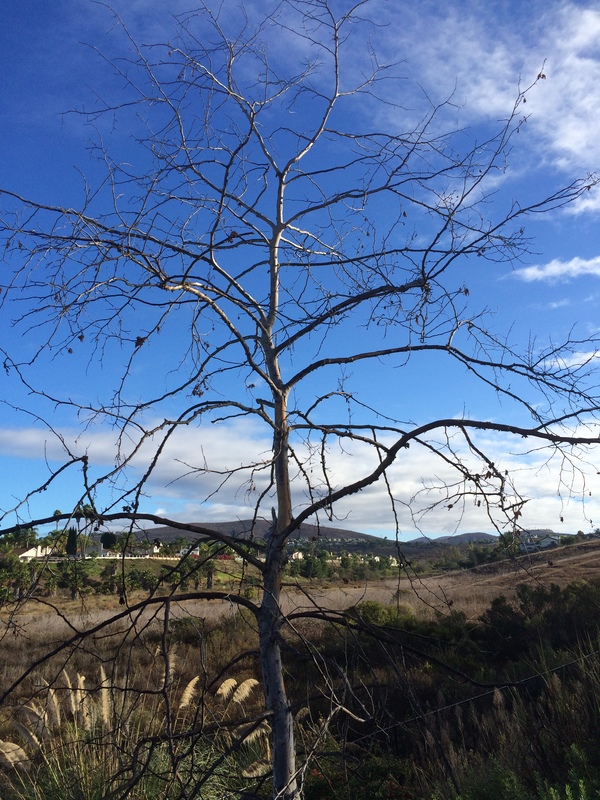 Earlier this week I had a late meeting near UCSD, so when I finished my regular work day I put my gym shoes on and took a nice long walk around the campus. As the sun dipped lower and lower into the sky, I loved watching the way it caressed the buildings and played hide and seek through the trees. 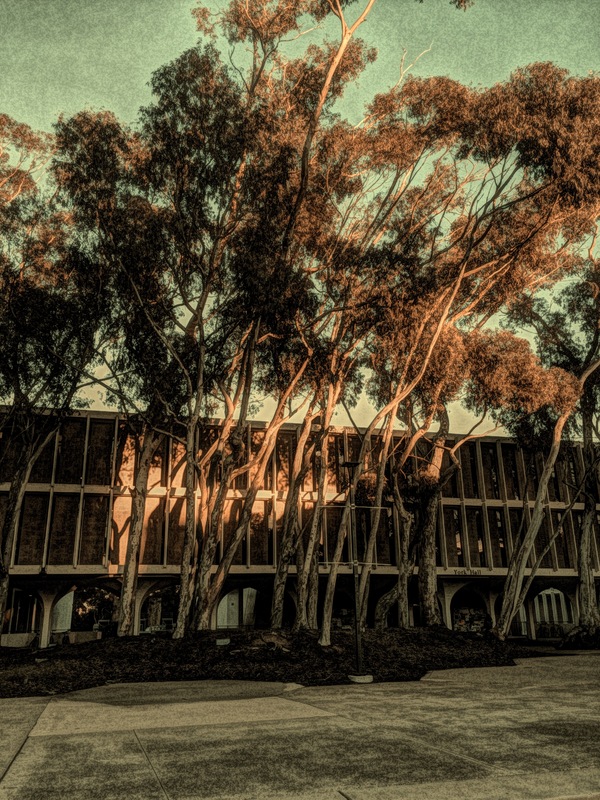 In this image, the low sun found its way through the tall buildings, lighting up the midsection of the eucalyptus trees in front of them. In this shot, the harsh setting sun created a flare of light as I shot directly into it. 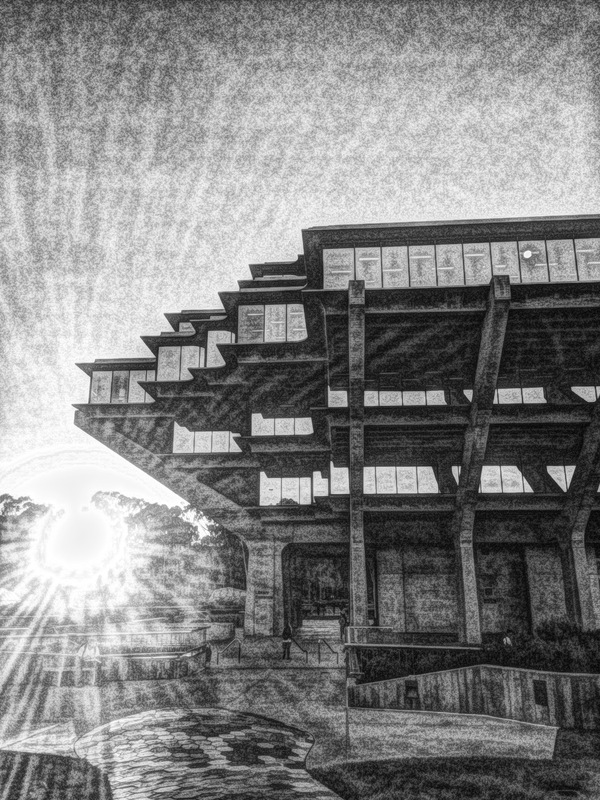 Using an app to convert it to black and white created a neat effect with the light. 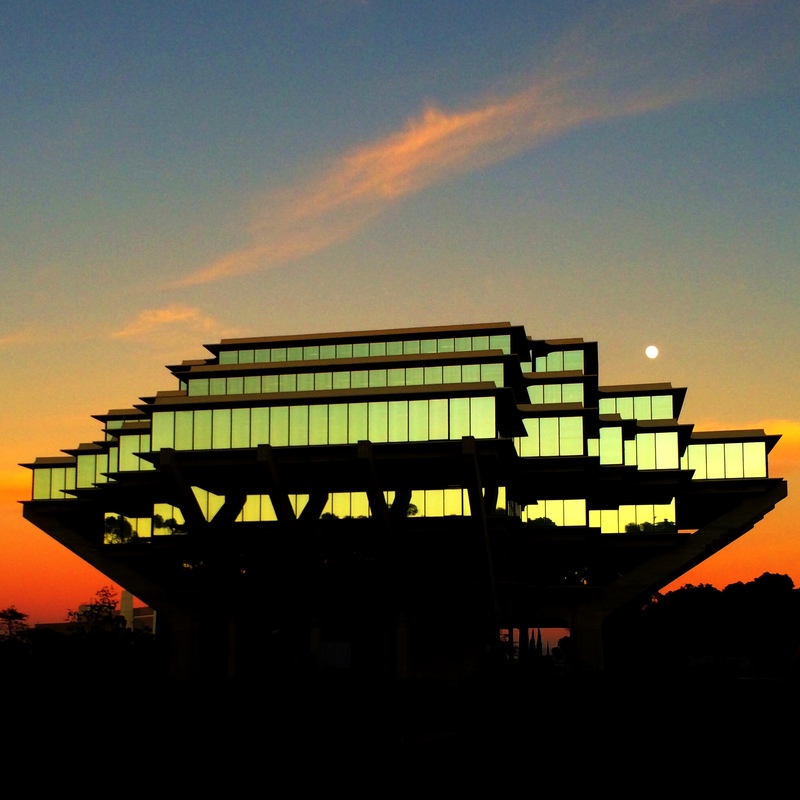 The Geisel Library at UCSD is such an architecturally interesting building that I couldn’t resist framing some shots. You can see the sun setting behind the building in this shot focused toward the west. Again, I changed it to black and white, creating lines of light framing the building. And as I walked I noticed the moon rising. I chased it through the trees, tracking it down when it hid behind buildings. And as I circled back toward the library, I found the moon sitting on its shoulder with the colorful afterglow of sunset in the background. This image is almost otherworldly! Yesterday I was at school late, after all, it is report card season. And it’s hard to stay focused on work as the classroom gets darker and darker as the sun sets. About a half hour after the sunset, my teaching partner and I headed out…and looked out toward the end of the hall and saw the most incredible colors in the sky. Brilliant oranges sat on the deep turquoise sea, and even as I took the time to snap a few images I knew that my camera would not do justice to the intensity of the colors. And here is one more, looking across the field at the baseball backstop with the ocean just beyond. How has the time change impacted you? What are you seeing and capturing in your photos that are because of the time change? My pictures happen to take place as the sun went down, but I can imagine that the morning light is also different, changing what you see. I share my photography and writing on social media. You can find me on Instagram and Twitter using @kd0602. If you share your photos and writing on social media too, please let me know so I can follow and see what you are doing. To help our Weekly Photo community find each other, use the hashtag #timechange for this week and include @nwpianthology in your post. How did you take advantage of your extra hour? 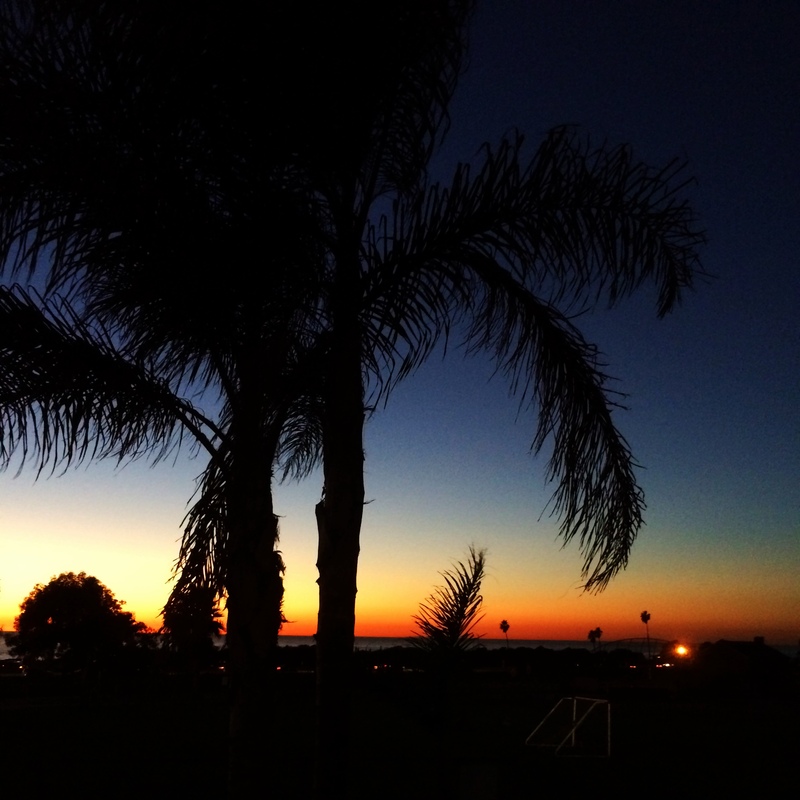 What are you noticing now that our days are shorter and our nights longer? I look forward to seeing the time change through your lens! 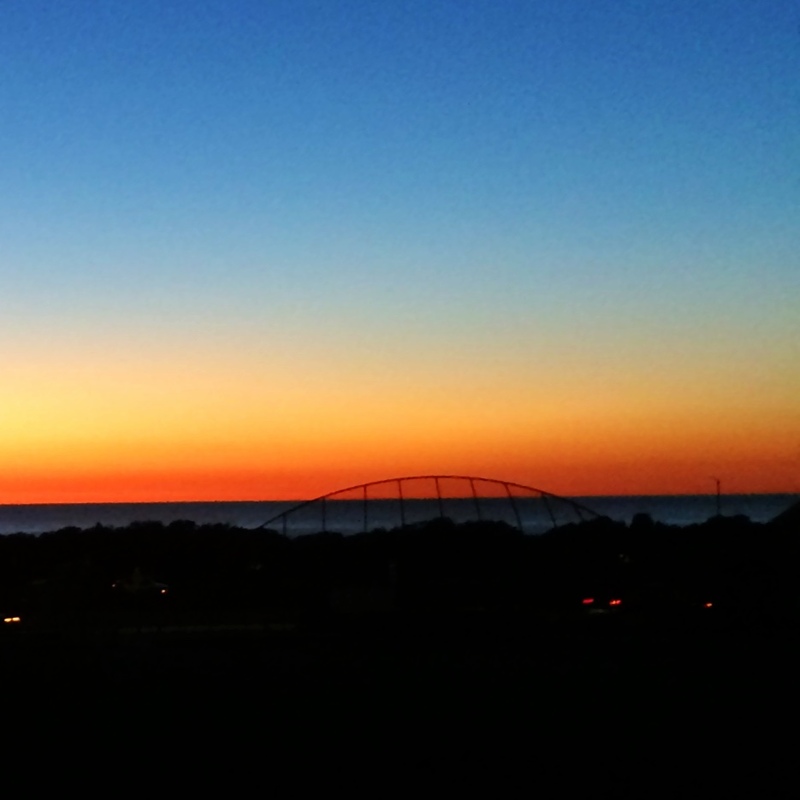 This entry was posted in Weekly Photo Challenge and tagged iphoneography, light, photo essay, photography, sunset, time change, ucsd, writing on November 6, 2014 by kd0602. One of the activities that I have my students do is something called a Twitter Memoir. It is a way for me to scaffold with my students on writing memoirs. We slowly build from 140 characters to 25 word memoirs, then 50 word memoirs. Finally they write their full blown memoir about a personal experience in their life. Many of my students are not on Twitter, but as I am introducing this exercise, I get a few to sign-up. I don’t require my students to be on Twitter because I have a Tweet board in my classroom where they can post their Twitter Memoirs. So, I challenge you this week to write a short 140 character memoir. It does not have to be on Twitter. For the sake of simplicity let’s just write them here at the iAnthology. 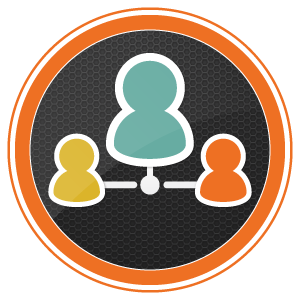 Also, if you want to know more about this process you can check out the book Troy Hicks and I co-authored titled Create, Compose, Connect. Have a blast doing this, my students do! I was intrigued by the idea of a memoir in 140 characters and spent some time composing. I was able to whittle down to 140 characters…but realized that I wouldn’t have room for hashtags if I used all the allowed characters. So I trimmed some more hoping to get down to a point where I could include a hashtag like #ce14 (for connected educator month) or #digiwrimo (for digital writing month). I finally posted this Twitter memoir in the iAnthology prompt space, I wasn’t able to get the characters quite small enough for the hashtags I wanted to include. Here it is. It includes 138 characters (spaces, punctuation, and letters)…and it happens to be exactly 25 words, so it fits two of the criteria Jeremy set out. With phone in hand I explore my world, snapping photos, collecting thoughts & ideas, searching for new vantages. Through images I connect. What will your Twitter memoir say about you? Can you craft it to include a mere 140 characters? I’d love to see yours…on your blog or on Twitter! (You can find me @kd0602) I’m going to tweet this post that includes my Twitter memoir…and include some of my hashtags along with the link. I hope you’ll share yours with me too! 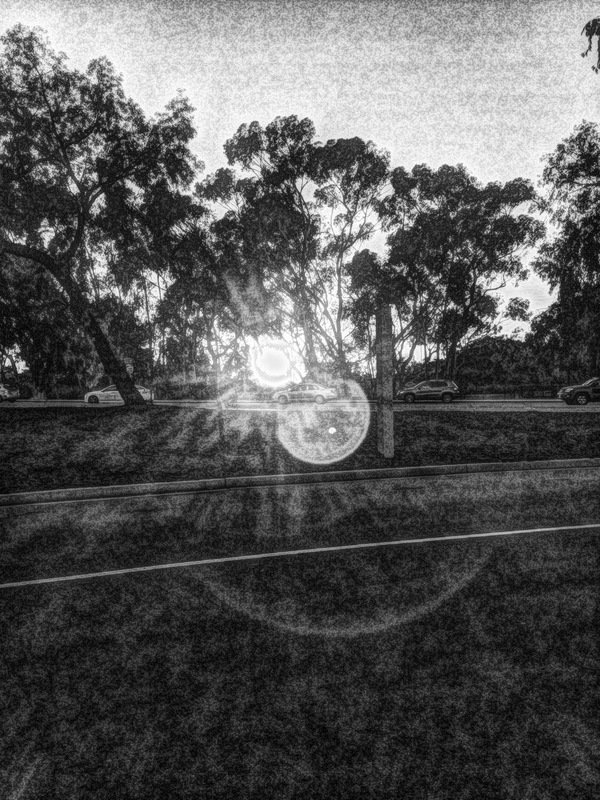 This entry was posted in photography, writing and tagged constraints, creativity, iphoneography, memoir, nwpianthology, Twitter, writing on November 3, 2014 by kd0602.